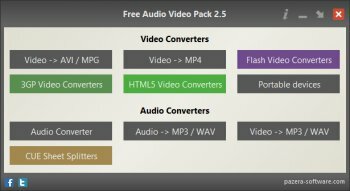 Free Audio Video Pack is a collection of portable video and audio converters which helps you to convert between all most popular audio and video formats like AVI, MPG, MP4, MP3, WAV, FLAC, AAC, MOV, WebM, WMV, WMA, OGG, WebM, FLV, OGV, 3GP. The package also includes applications that allows you to extract audio tracks from CD images based on the CUE sheets. All converters have a very similar interface and they are simple to use, even for novice users. A preliminary review: Converted an MP4 file to Avi. Default 'Auto' settings are pathetic, horrible results. However, there are LOTS of converting options so retried with far better results. I have been using Freemake and XviD4PSP 5 for video and audio(audio only initially) conversion needs, but Freemake has been getting too intrusive of late and XviD4PSP 5 has been giving me issues of late due to being old, and the later versions of XviD4PSP are just AWFUL. Will give this software more tries for real keeper conversions rather than just for mere testing. So far this all-in-one software may be the real deal. 4 stars for now, may be less later or 5 stars when used more. To a Launderette..Sorry... Unrateable by Myself.. G'luk. 1*... For the Effort Tho..! !